Sam Walker & Gavin Royce, the NYC-based duo better known as Walker & Royce, have only been producing together for 4 years but have already taken the dance music world by storm. From appearances on some of the scene’s most reputable labels to sets in some of the world’s best clubs, the pair are clearly on top of their game and have plenty more tricks up their sleeve. With a genre-bending sound gaining them fans like Pete Tong, Sasha, and Adam Beyer, their future is definitely bright. We had the chance to catch up with them ahead of their show in Dallas tonight about their latest tracks, hometown love, and more! RP: Hi guys! Thanks for chatting with us today. Where are you writing from? Your new single “Follow” is a catchy, synthy, funky house groove. What inspired it? Really it was Steven Klavier, he is a really talented vocalist and writer that is for the most part undiscovered. He is here in Brooklyn with us and has been a close friend for a while so we really wanted to start working with him, and then he also killed it. I think people are going to start seeing his name featured on a lot more tracks in the future as well. We actually have another EP dropping on Safer At Night with him next month. Tell us about your studio setup. Any current favorite pieces of gear? We work on Ableton and do a lot of our stuff in the box… Diva, Reaktor, Ableton Operator are VSTs that we love to use. For hardware we recently added the Bass Station II and Mini Nova from Novation which are both amazing and give us totally different sounds. We also like to use some vintage synths when we can, recently we had a Memory Moog in the studio with us. All the stuff we have is really mobile which helps when we are on the road, we recently set up a European studio so we have place to work when we are over there. Sometimes we hear a song, it doesn’t matter if its a House track or some forward thinking R&B, it could even be a old Disco tune we missed, but when it sounds so good to us that we need to listen over and over to it because we are obsessed, that’s the feeling we want people to have when they hear our music. You’ve been producing together since 2011, what have been some of your favorite moments together so far? Well we have been friends for much longer, so one great moment was the “duhhhh” moment when we figured out how good of a partnership it would be. Also when we did our first London show, it was at a warehouse full of 4,000 ravers that all wanted to hear our track “Connected,” when we played it the place went nuts…. That is a moment we will never forget. Some of our favorite labels such as OFF and Crosstown Rebels have featured your tracks. What are some labels that you keep an eye on? Safer At Night out of Brooklyn is run by Curses, DKDS, Cranks and Total Fitness, they are making big waves right now. Catz n Dogz’s Pets Recordings is always top notch. We are also really into Waze & Odyssey’s W&O Street Tracks. Our other Brooklyn homies at Let’s Play House are really killing it as well…. so many to name! 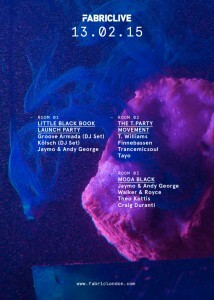 You’re about to play at Fabric alongside Groove Armada and Jaymo & Andy George! How do you go about preparing for a set like that? This is sooooooo huge for us!!!!! Playing at Fabric is a dream come true and we are over the moon to do it with the legends Groove Armada and J&AG. As for preparation we have to be 100% on point in track selection. We are going to combine some all time favorites with some of our new stuff and hopefully some undeniably good bangers. We have heard great things about the Dallas scene, so it will be a nice opportunity for us to test out some new tracks of ours. You’re based in New York, how does the dance music scene there compare to other cities in the US? Europe? We love NYC and it has completely shaped us… however, the club scene here can get very manic in our opinion. It can be over saturated on certain nights, but when NYC goes off it is really amazing. What we love about other US cities is the overwhelming sense of community, it may be a smaller scene but everyone is tight knit. As for Europe, its a whole new level of awareness that the states have yet to match. Everyone just is more involved and knows all the tracks, you need to be on your toes as a DJ there. Where do you see yourselves at the end of the year? We hopefully will still be doing what we are now, this is a labor of love for us and we feel so blessed to be involved at the level we are at. We just want to keep growing as artists and playing more consistently, we have made it our full time jobs now so the personal pressure to grow is really on us now. We are also aiming to start our own label, a radioshow and some parties that we curate…. Stay tuned! Be sure to follow Walker & Royce on Soundcloud and catch them live tonight in Dallas at Red Light for the January installment of BOOM!‘s ELLUMENTAL party alongside residents Jwho and Michael Todd. Snag your tickets here!